If you’re browsing through advice on SEO strategies and boosting your keyword rankings, you may see the same word over and over: SERPs. You know you want your content and website to appear on SERPs, and you know that your overall SEO and content marketing strategies should consider SERPs, but you might not know exactly how they work. In order to write content that Google recognises as useful and relevant to your users’ search, you will need a basic understanding of SERPs and how they are set up to create an optimal user experience. 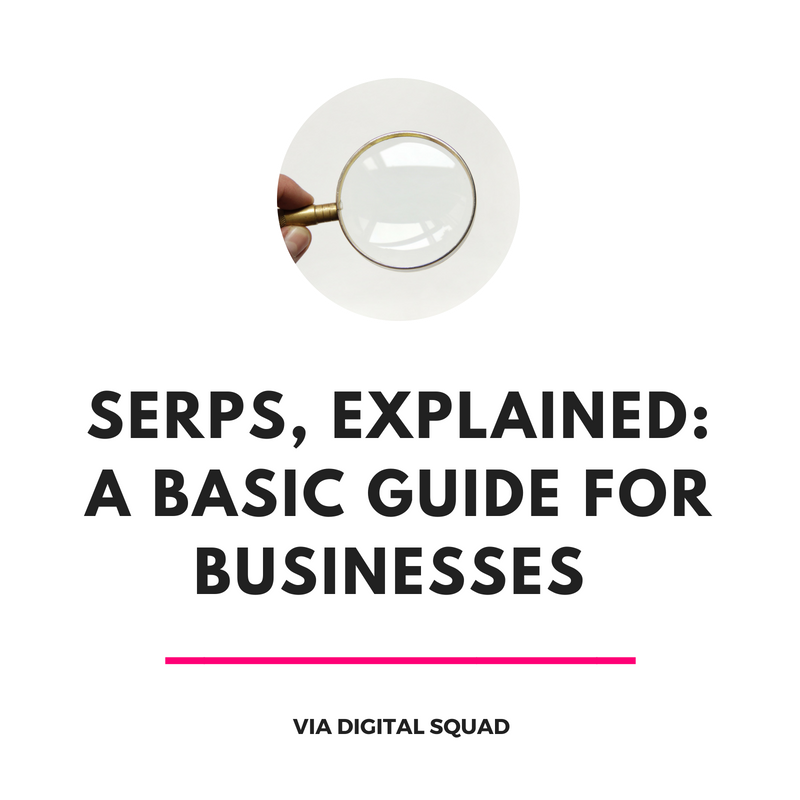 Even if you are unfamiliar with the term, you are probably very familiar with what a SERP actually is. SERP is actually an abbreviation for “Search Engine Results Page.” When you type a word, phrase, or question into a search engine, the results that you get back are SERPs. As you are probably aware, SERPs aren’t just text results anymore. Not every SERP looks the same, either. A page that gives results for “hotels in Croatia” may have a completely different format than a page for “what are the ingredients in chocolate chip cookies?” As Google has evolved to provide a better experience for users, they have added more features than these traditional text results. Different features of SERPs allow users to interact and view data through images, videos, facts, and even social media posts. Why Is It Important to Understand SERPs? As a marketer or content creator, knowing and understanding these different SERP features can allow you to communicate answers and data to Google in a way that it shows up on relevant SERP features and delivers the right information to potential customers. Google’s top priority is to understand the intention behind searches and provide quick answers for users. If you have the answers that targeted users are looking for, you can structure and write content in a way that it is recognised by Google and shows up in the right SERPs. The higher your content ranks in SERPs, the more often it will be seen and the more traffic you can generate. Writing informational, relevant content is a win-win for users, Google, and your business. In addition to text posts, you might find the following features on SERPs. Not all of these features will be relevant or to your content; if you are not on Twitter, for example, you don’t need to worry about the Tweets feature. If you do see some formats that could provide useful and easy-to-read content for relevant search engine users, keep these possibilities in mind when you are discussing your content marketing strategy. Google AdWords allows businesses to bid on ads that target specific search terms. These ads appear at the top of bottom of search results. In order to create an ad that ranks at the top of the page and appears on the most relevant keywords, you will need to create and implement an AdWords strategy. This strategy may include writing and testing ads that generate clicks, monitoring your AdWords spending, or creating landing pages that give your ads more credibility. Learn more about AdWords strategies and tips with Digital Squad. Google AdWords also allows ecommerce businesses to post their products in Google Shopping results. Shopping results show an image of the product, the title, price, and even a list of reviews pertaining to the product. Businesses can also set up special offers and deals for users who buy the product through Google Shopping. When users ask a question, they can get a relevant answer without clicking on any website. Featured snippets pulls and displays a 40-50 word (or short list) answer to the question. The websites that provide these featured snippets often see a boost in traffic and conversions. Google may provide related questions under featured snippets. When users click on individual questions, they will be able to see answers that are around the same length of the original featured snippet. Knowledge graphs allow users to discover simple facts about a person, place, or event. These are usually placed on the right side of the SERP, and may include images or even videos. Google typically pulls these facts from Wikipedia or Wikidata, but there are strategies available for building knowledge graph content for your business or a thought leader. If a user is looking for hotels, coffee shops, etc. around a certain area, they might see a local pack. These are maps that show the locations, names, reviews, and possibly prices of different results around a certain area. If your business is not appearing in Local Pack results, you may want to look into establishing your business on Google My Business. Google will display and update recent tweets from relevant businesses and figures below a handful of top search results. If your tweets are showing up on search results relevant to your business, consider Twitter as part of your overall social media marketing strategy. Awkward or old tweets from years ago may give the impression that you are not up to date on social media or other marketing strategies. If you have optimised videos on YouTube or Dailymotion, these may also appear. Go through the videos your business posted online and check the descriptions and thumbnails. Blurry thumbnails or missing descriptions will turn users off from clicking and interacting with your content. When your content appears in relevant SERP features, you may see a boost in traffic and engagement. This is also a sign that Google recognises your content as a relevant source. Like general SEO, writing content for SERP features requires more than one or two magic tricks. If your goal is to be featured on SERPs, you will have to optimise your entire website and set your content up for success. In order to put your content in front of your customers, you will need to meet them where they are searching. Conduct thorough keyword research to figure out what customers are searching for at every step of the buyer’s journey. Buyers may be looking for different things when they are just conducting research about a topic, browsing for different related businesses, and searching with the intention to make a purchase. This includes thinking and writing like your customers. What terms are they using to describe their problems and find solutions? What solutions do they think will help their problems initially? If you can get a hold of the terms and questions that your customers search with, you can deliver answers straight to the SERPs that they see. Google isn’t going to feature a website that users won’t find useful. Featured snippets, for example, typically only pull information from websites that are already ranked on the first few results for the question. Establish your website as a credible resource by optimising each page and creating a good user experience. Complete a site audit and make the right steps to boosting your Domain Authority score and overall rankings. These steps can be as simple as fixing broken links or adding fresh, shareable content. Google AdWords gives you more control over the content that you create for specific keywords. AdWords also expands the possibilities about where your ads appear; you can create a display ad that appear on websites in the Google network (New York Times, YouTube, etc.) Ads can feature just text, or a combination of text and images or products. Google AdWords is not a replacement for an optimised website. In order to create a high-ranking ad, you will have to build a website or landing page that Google feels is relevant to the user experience. If you are creating an AdWords strategy, you should create a partnering SEO strategy. The two projects will benefit each other; another win-win for your overall digital marketing efforts. The evolution of SERPs is still in progress. Tweets have only been a feature since 2005. In the future, you may see podcast episodes and other social media content featured in SERPs. There are plenty of opportunities for creating content that helps potential customers along their journey. Remind your team to keep an eye out for different ways that you can get creative with your SEO and content marketing strategies. The Google algorithm has changed quite a bit throughout the years…the team has Digital Squad has spent thousands of hours of research on its changes and how it creates SERPs. We know the ins and outs of what it takes to create a healthy, relevant website that provides an excellent user experience and is recognised by Google. If your business wants to improve your rankings and possibly appear on different SERP features, reach out to our SEO experts.